Design culture has always forged a dialogue with the currents of thought and the discipline in vogue in a given moment, opening to rationalism in the period between the two World Wars and to anthropology with the advent of the market society. Today reflections on design are being contaminated by a new sphere, that of the cognitive sciences, which become indispensable for any real understanding of digital social interaction. The ideal starting point is that of the theory of the ‘extended mind,’ according to which thought does not take place only inside the brain but is ‘extended’ through external tools (from the abacus to the agenda, the compass to the ruler) that support the implementation of cognitive processes (calculations, inferences, memorizing, etc.). Given this interpenetration between instrumental and mental dimensions, the characteristics of the cultural sphere determine those of the mental sphere. So the question is: what are the characteristics of the present cultural context, which is increasingly ‘digitalized,’ and how are the modes of thinking being redefined? The GPS network, language translation, supports for memory storage and search engines boost cognitive abilities (the mind) to a previously unimaginable level. But this has a paradoxical outcome: the brain, in fact, having been enabled to delegate more and more cognitive work, forgets how to process information entirely, losing its capacity for critical thinking. Due to the ‘divided’ nature of the mind, the more the external environment performs on a cognitive level (and the digital ecosystem takes this to maximum heights), the more the brain, with its strategy of saving energy shared by all biological organisms, tends to reduce its own part in the work, with the resulting neural adaptations (deficits, in this case). Thinking becomes more superficial, reflections become ‘cruder,’ and three quarters of those who read a piece of news on social networks insert comments without every having read the article in question. Even more worrisome is the rise of functional illiteracy, i.e. the inability to understand the meaning of a text after having read it and, in general, to go beyond one’s own experience, which becomes the sole gauge of assessment of reality. Therefore it is enough to come across some immigrants during the trip from home to the bar to become convinced that “Italy is being invaded,” even if the facts tell just the opposite story. Functional illiteracy is encouraged above all by the degree of customization of information made possible by the social networks, which create an ‘echo chamber’ around the individual user, in which he hears only the confirmation of his own voice: in fact, more or less consciously, the user has made a playlist of blogs and ‘friends’ that share his views. This type of mental environment dangerously inhibits what Freud called the “pleasure principle” and the “reality principle,” i.e. the desire for immediate gratification and the constraints put on that desire by reality (the child wants to eat more and more candy, but the threat of a stomach ache stops him from doing so). It is precisely the acceptance of this negative external response that reinforces the process of maturing of the individual, who learns to relate to others to the extent that the recognition of their individuality acts to inhibit excessive expansion of one’s own. In the echo chamber, on the other hand, everything is devised to never upset the user, so the pleasure principle expands, at the expense of the process of gaining maturity. The results include the phenomenon of haters, users who are incapable of relating to others ‘as adults,’ who respond to posts containing different viewpoints through comments pacts with barely literate hatred. The rise of populist forces in Europe and the United States can be attributed to a great extent to the spread of the liquid mind, which – cognitively effective in the extended dimension, but with its cerebral core increasingly incapable of profound thinking – reveals a distressing vulnerability with respect to fake news, created on purpose to reinforce the opinions existing inside the echo chamber. Even more distressing is the increasing scorn expressed for science, whose methods represent the highest recognition of the reality principle. Instead of coming to terms with scientific evidence, liquid thinking prefers to believe that vaccines are dangerous or the earth is flat, because conspiracy stories jibe perfectly with a superficial interpretation of phenomena. All these cases demonstrate that with the liquefaction of thought the very notion of ‘truth’ as opposed to ‘falsehood’ is in danger. We have always taken for granted that truth, though hidden by propaganda, would continue to remain intact under the veil of falsehoods. Today, however, we are no longer looking at a mask that covers the truth, but at an impossible tangle of truth and lies that spreads before our very eyes, and cannot be undone without great effort in the opposite direction, without the stubborn labor of discernment, however unpopular and undervalued it might be. 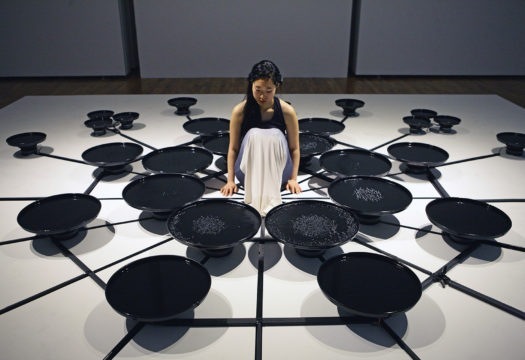 Lisa Park is a Korean-American artist based in New York known for her work with biofeedback devices like cardiac sensors and brainwave headsets, which she uses to translate mental states into artistic performances. Photo Georg Schroll and Jan Rijk. 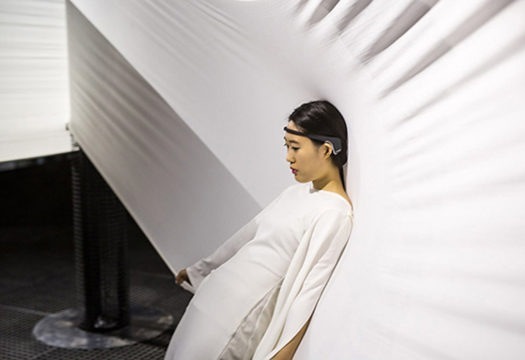 Tthe artist wears a 150-meter dress for the installation NUE, which translates real-time monitoring of brainwaves into sounds, wrapping the audience in a cocoon of sound and white fabric. Photo Georg Schroll and Jan Rijk. In the project Eunoia II Lisa Park takes inspiration from the 48 emotions defined by Baruch Spinoza as states of mind and body. 48 speakers topped by aluminium plates with a veil of water translate states of excitement, engagement, meditation and frustration of the performer, detected as brainwaves by a special sensor. Photo courtesy of Lisa Park. 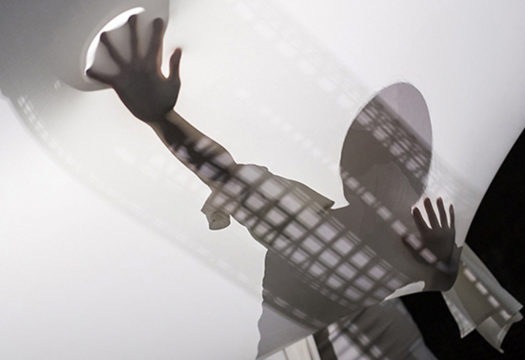 With the installation Blooming Lisa Park underlines the importance of the human presence. 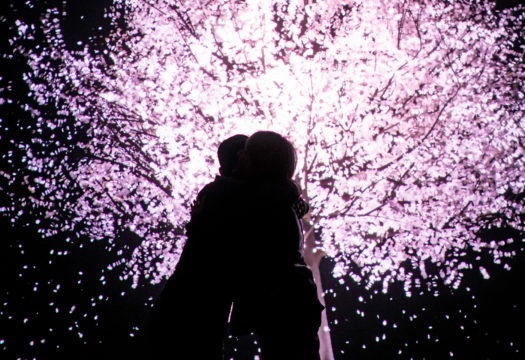 Responding to the physical contact of the performers who embrace each other and hold hands, a 3D cherry tree takes form and blossoms. Project made with the support of Nokia Bell Labs and the New Museum’s NEW INC. Photo courtesy of Lisa Park. 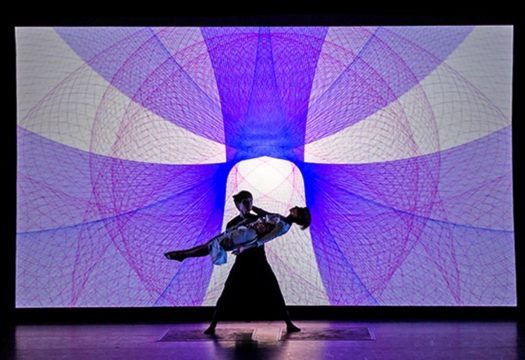 Lisa Park, Harmony, an audiovisual interactive performance that explores the balance of Yin and Yang through visualization of sounds. A female dancer performs as Yin, representing the Moon, and a male dancer as Yang, representing the Sun. 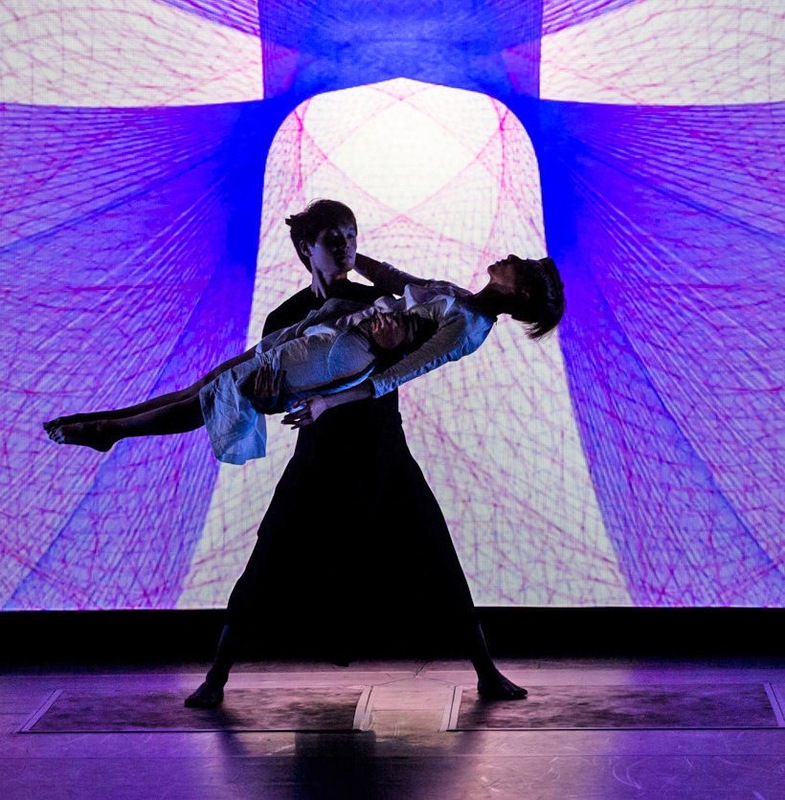 The sounds flow in correspondence to the movements of the dancers, who interact to demonstrate their different contributions to the harmony of the whole. Photo courtesy of Lisa Park. 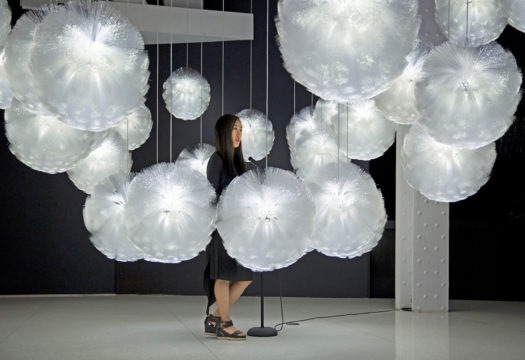 Lisa Park, Luma, an interactive and reactive luminous sculpture based on natural phenomena of bio-luminescence, composed of millions of optical fibers lit by internal LEDs, activated by sound. In collaboration with Kevin Siwoff. Photo Eric Petschek.